More from Michelle. Today's March muse/poetry form combination: Small Press/Diamante. I am nearly incapable of containing my enthusiasm as I tell you all that March is National Small Press month. Why am I excited to tell you about this group of intrepid publishers? Plenty of reasons, but let me start by explaining what exactly the term "small press" means. A "small press" is basically just a relatively unsuccessful book publisher. No reallly, that's what it is. A small press is defined by how few books they publish (12 or fewer a year) and how few people read people those books (5,000 per book). You, like me, may be confused about if the small press is the same thing as the independent press. Short answer: No and no one else was wondering that anyway. 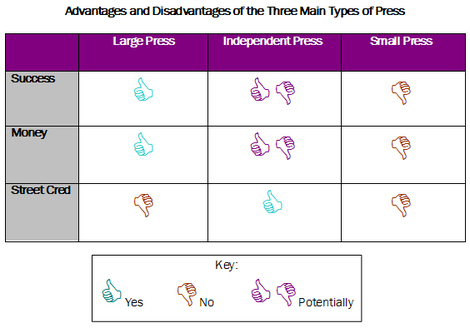 Long answer: Many independent presses are also small presses, but a small press isn't necessarily an independent press. I shall quote from the Small Press Center to address this question: "The difference is that the "raison d'etre" for independent publishers is not their small size but the types of books they publish and their cultural and financial point-of-view." So independent presses may be small because no one else subscribes to their crack-pot philosophies so they don't sell more books, whereas small presses aren't small for any philosophical reason so much as just that the publisher can't print and sell more books. Well, I can't think of a group more deserving of a poem (at least more deserving of the poem I'm going to write today). Small press publishers pour their heart, soul and children's college funds into what amounts to a completely intellectual exercise that will no doubt bankrupt their families and go under -- the press's closing noted sadly by the few tens of people who read their books. Though individually small-scale publishing is the profit equivalent of using dollar bills as toilet paper, on a larger scale small press publishers are taking a larger share of the book reading market from big publishing houses. So this poem goes out to them, because capitalism be damned they keep doing their thing and in the process they're sticking it to the man (the man being Random House, not Amanda Bynes or Gheorghe Muresan). This poem form is called a "diamante," which if you understood the phrase "raison d'etre" you would know is French for diamond. Half the the poem describes the words in the first line, and the second half the poem describes the words in the last line. While it is true that Gheorghe Muresan was "My Giant" he (as well as the entire team) starred in the Bullets season ticket holder video "You da man" for the 1997 season.